Kent's "Hooligan Libertarian" Blog: I know, let's all be equal! I know, let's all be equal! Socialism doesn't lift every one up equally; what it does is it attempts to shove everyone down equally. But it even fails at that. There are always some elites doing the pushing who will lift themselves up at the expense of everyone they are pushing down. Socialism still results in a "1%" who own the vast majority of everything, while the majority of the people have almost nothing. Much worse, in practice, than the economic "systems" socialists love to hate. The only equality in the world is that everyone-- and I mean every single individual everywhere on the planet (in the future, off-world, too)-- has the exact same rights as every other individual. No difference at all. That's it. That's the equality you get. Beyond that, nothing is "fair". You may work really hard, and live right, and get totally screwed over. It happens. It's nice when other people try to make you believe the world is "fair" by helping you overcome problems, but that's what people can do for each other; it's not what the Universe does. 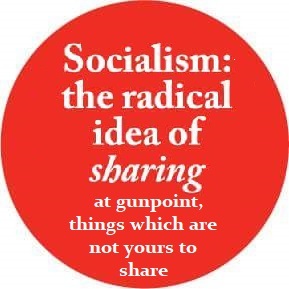 And it's not what socialism brings.